Manny “ManRam” Ramirez was signed to a minor league contract to be a player-coach at Triple-A Iowa by The Chicago Cubs and their President of Baseball Operations Theo Epstein, who was with Ramirez for seven years in the Boston. 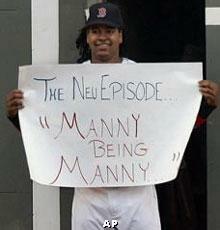 So now he can teach all the young new players how to just be Manny being Manny. Pedro Martinez was one of the best pitchers the game have ever seen, and he takes a little time from his roll of “Special Assistant” (We all know that just means him and Kevin Millar are the Sox official party starters, and they are good at their job.) for the RedSox to discuss the art and science of pitching. “Pitching is both [art and science] and you have to put them together. You have to study a lot. You have to study the movement of your pitches – the distance your pitches move compared to the swing paths of batters. You have to learn to read bat speed against the speed of a fastball. You can tell a slow bat or a long swing, or a short, quick swing. You counter those things. If a hitter has a slow swing, I don’t want to throw him anything soft. I want to go hard against slow. If he has a quick bat, I probably want to be soft more than I want to be hard. You have to be able to repeat your delivery and be deceiving at the same time. The folks @CigarCityBeer announce Homefront IPA, a beer aged on Louisville Slugger maple bats. Cigar City hopes to brew 800 barrels of the baseball bat aged beer. Proceeds donated to Operation Homefront.